For the first time in Australia’s history, a football team consisting entirely of transplant recipients will play a ‘Thanks for Life’ charity match this Saturday afternoon at Cromer Park. The squad is made up of those whose lives have been saved by donated hearts, lungs, kidneys and livers. One of those players is Daniel Bragg, first-grade player for Manly United and a kidney recipient. Bragg will take to the field despite being on dialysis for hours each day as he waits for a second kidney transplant after suffering from organ failure. 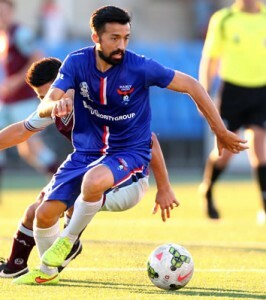 Daniel Bragg in action for Manly United FC. Pic: Manly United FC. Daniel will run out against a Belrose Terrey Hills Invitational 11 which includes Tim Bowland, who donated a kidney to his sister Angela three years ago. The teams will play a full 90-minute game competing for the Doujon Zammit Shield. The event will raise awareness of the importance of organ and tissue donation, encouraging people to register their decision to be organ donors in Australia. Doujon Zammit’s family donated his organs after he was killed whilst on holiday in Greece in 2008. Through the joy of sport and the ‘beautiful game’, the ‘Thanks for Life’ charity match is a celebration of life, and a triumph of spirit. Kick-off is at 3.30pm, Saturday 12 March at Cromer Park. On Sunday 13 March, the same team will play in a half hour exhibition match before Manly United’s home crowd, and the winners of the Doujon Zammit Shield will be presented ahead of the premier league match. Kickoff for this match is scheduled for 2.00pm. The Zammit family will be there to watch on, as Doujon’s brother Zeake joins the Transplant Australia side on Sunday. Come along to show support for this inspirational team, then stay on to watch Manly United Football Club take on the Sutherland Sharks FC. You can register to become an organ donor in Australia here. For more information about the Transplant Australia Football Club visit our football page.